The length - L - of a chord when dividing a circumference of a circle into equal number of segments can be calculated from the table below. The chord length - L - in the table is for a "unit circle" with radius = 1. To calculate the actual length of a chord - multiply the "unit circle" length - L - with the radius for the the actual circle. A circle with radius 3 m is divided in 24 segments. From the table below: the length - L - of a single chord in a "unit circle" with 24 segments is 0.2611 units. Engineering ToolBox, (2013). Chord Lengths when Dividing a Circle in Equal Segments . 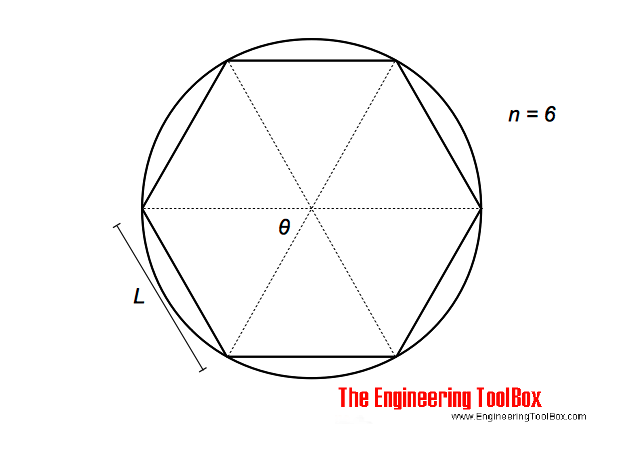 [online] Available at: https://www.engineeringtoolbox.com/chord-length-circumference-circle-segments-d_1870.html [Accessed Day Mo. Year].